That will be all, carry on. So yeah, Abunai was a lot of fun. I didn't made a lot of pics myself because I had forgotten to put the memory card back into my camera after formatting it (DOH!) but luckily for me others had made a lot of pics. Anyway here is my report with some pics made by others. The highlight of Abunai were all the long lines. To get into it you had to wait for 3 hours outside in the cold. That is of course unless your name is Epps and happen to have connections. In other words, less lines for me and my roommate. Still all the major events were filled with long lines so unless you timed things right you had to wait... A LOT! There were some competitions with some awesome contestants but must where pretty boring/dull. 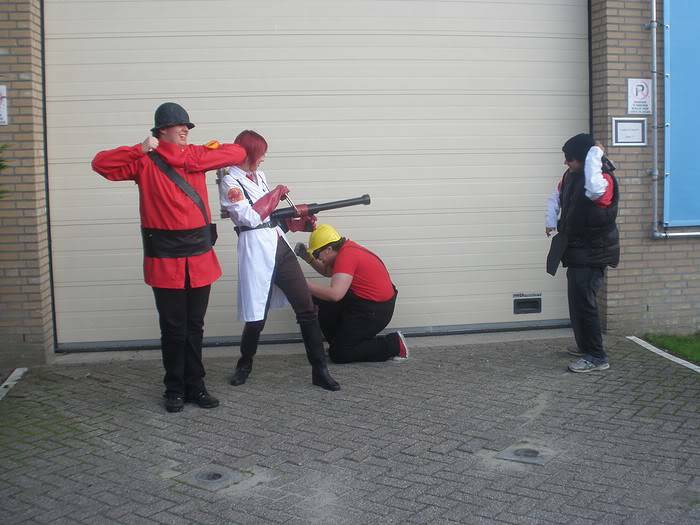 During the cosplay acting competition there were 13 acts and 5 of them used the same Final Fantasy Victory Fanfare joke after a battle; NOT FUNNY! As an アニメ fan in Europe I already know all the decent dealers around here so there wasn't a real surprise for me. Archonia (online shop and main sponsor) had a stand and just as on their site they sold for cheap prices (€7 instead of €12) so erm yeah... btw I only bought one manga and an EVA-01 figure. The hotel was a four stars luxury hotel yet no one had a bathtub in their room, not even those with an extra luxury rooms (I know because I visited one). The beds where rather small, around 200x120cm and that's supposed to be a bed for two! Still they were soft and since my roommate was a female friend of mine I didn't mind (until I woke up with morning wood). Anyway that's it, I am back again and well rested. Time to play some TF2 right NAO! Wait, something is wrong with those pics. The demo is supposed to be black. Epps that is a quote worthy of going in your signature amirite? Chuck wrote: Epps that is a quote worthy of going in your signature amirite? 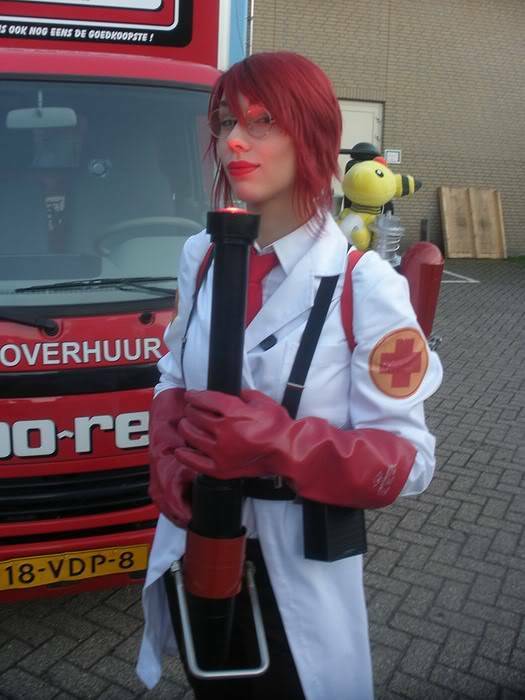 This girl inspires me to work on the female medic again! I will show her off on the orange server soon. Anyway seems like you had a nice time Epps. Is that girl Rosa? Haha that Demoman looks funny although he should be a black scotsman. 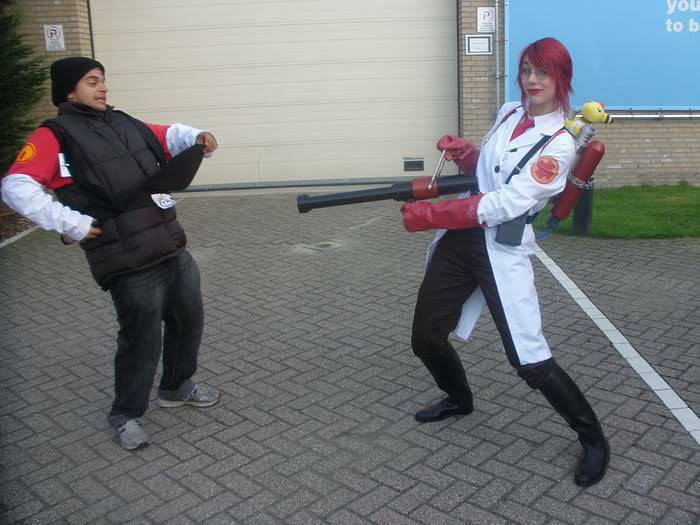 Eraserhead wrote: This girl inspires me to work on the female medic again! I will show her off on the orange server soon.